In the last edition of Attorney at Law Magazine, I discussed with you the differences between a disc bulge and the types of intervertebral disc herniations. I also referenced an article from the New England Journal of Medicine stating disc protrusions may be present with the absence of symptoms. 1 This article is at times used as a defense against the injured client or to challenge the treating doctor’s or expert witness’ opinion that the disc herniation is the cause of the patient’s pain. Have you heard in the past some comment about “your client’s MRI showed disc degeneration and the disc herniation was probably there before the accident” or “there is no disc herniation so your client cannot be having that much pain.”? The goal of this article is to provide you resources on how pre-existing degenerative disc increase the risk of injury and what evidence might be present to support that the disc herniation is the cause of your client’s complaints. 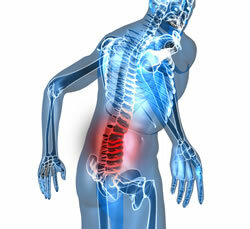 It is probable that many of your clients are not young healthy individuals without degeneration of the disc or joints. Many adults over the age of 40 have at least one level of a pre-existing underlying degenerative finding. It is important to understand how these pre-existing findings increase the risk of bodily injury. A study in 2008 examined age and co-morbid conditions and their relation to bodily injury after a motor vehicle collision. The results of the research showed co-morbid conditions influence the body’s physical intolerance to traumatic forces. In other words, pre-existing conditions do not react to traumatic forces the same way as healthy tissue.2 Other researchers found a similar correlation to the degenerative changes in the spine and the increased risk of injury and prolonged recovery as compared to those without degenerative changes in the joint or disc.3,4 The evaluating doctor, patient (client), insurance adjusters, and you the attorney protecting the rights of your client must understand this important bio-mechanical concept in the correlation of bodily injury and causation which can lead to a persistent functional loss. Can a disc be the cause of your client’s pain even if the disc is not herniated? Yes it can, there is a branch of the spinal nerve called the recurrent meningeal nerve that innervates or supplies the outer 1/3 of the annular fibers of the intervertebral disc. These nerve fibers are sensory and carry pain signals to the brain when the tissue of the disc are damaged; this is called disco-genic pain. If the disc is torn, the disc itself can be the source producing your client’s pain. Remember, the risk of this type of injury is increased with degenerative changes; as the disc is less pliable and cannot resist the compressive and shear forces produced in a motor vehicle collision injury is more likely to occur. Panjabi determined following a rear impact; the lower cervical spine goes through a complex loading consisting of an extension movement and posterior shearing and compressive forces. He hypothesized that this loading pattern could injure the intervertebral disc and the presence of nerve endings in the outer annulus fibers makes disc injury a plausible etiology of the pain. If a disc herniation is present on the MRI scan, how do you know if it is the pain generator? If the herniation is causing nerve root impingement, the side the disc herniates to should be the same side as the person’s pain. Therefore, a left side disc protrusion would cause pain in the left extremity. While it is beyond the scope of this article to go into the details of individual nerves and the neurological testing that should match each injured level you should keep in mind in addition to extremity pain, there may be a weakness of certain muscles and a loss of dermatome sensation in the left extremity. I encourage you to read the imaging reports and know the side of your client’s or policyholder’s complainants. If the disc herniation is on a different side of the person’s complaint, ask more questions, because the herniation may not be the reason for the pain. What if the disc herniation was pre-existing, was it active prior to the MVC or dormant? The patient’s history and past medical records would help determine this. The study I referenced at the beginning of this article is a reference that some people have non-active disc herniations, meaning the person does not have symptoms to correlate to the findings on the MRI.1 Post-trauma, it is medically probable a non-symptomatic weakened disc can become active producing symptoms that cause the patient to alter their lifestyle and work duties. This would be an example of how a dormant pre-existing degenerative condition becomes active secondary to traumatic forces. This active condition can also represent a worsening of the pre-existing condition altering your client’s or policyholder’s activities of daily living. Pre-existing degenerative changes increase the risk of injury and prolong recovery. Injury to annular fibers of the intervertebral disc can be sources of pain with or without the presence of a disc herniation. A disc herniation can be dormant, without symptoms, but can become active when a traumatic force is placed on it, creating the traditional pain patterns seen with a disc herniation.